In a finely-poised first half, both Sutcliffe and Peter Mata'utia hit the post with conversion attempts for each side while Sutcliffe hit the post with his second attempt after Handley's try. 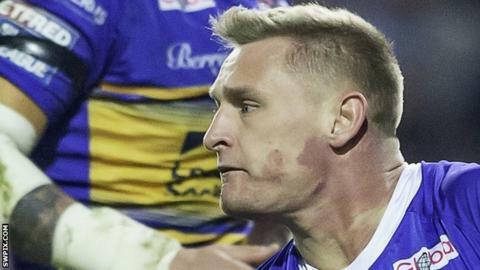 After Watts' score levelled the scores, Leeds had two tries denied by the video referee, first when Jamie Jones-Buchanan was judged to have obstructed play in the build up to Hurrell crossing over and then when Kallum Watkins knocked on in the air before Tom Briscoe touched down. Super League top try-scorer Handley added to his tally to bring up his total to nine tries this season and Leeds later rallied to lead 20-4 with just over 20 minutes remaining before Castleford's comeback. After Minikin, Clarkson and Foster's tries levelled the score at 20-20, Calum Turner missed the chance to put the Tigers into the lead and surely win the game when he missed the extras. Castleford: Mata'utia, Clare, Minikin, Shenton, Eden, Trueman, McShane, Watts, Milner, Millington, Sene-Lefao, Foster, Holmes.